For other uses, see Cree (disambiguation). "Nehiyaw" redirects here. For the children's book author, see Glecia Bear. The Cree (Cree: Néhinaw, Néhiyaw, etc; French: Cri) are one of the largest groups of First Nations in North America. In Canada, over 350,000 people are Cree or have Cree ancestry. The major proportion of Cree in Canada live north and west of Lake Superior, in Ontario, Manitoba, Saskatchewan, Alberta and the Northwest Territories. About 27,000 live in Quebec. In the United States, Cree people historically lived from Lake Superior westward. Today, they live mostly in Montana, where they share the Rocky Boy Indian Reservation with Ojibwe (Chippewa) people. 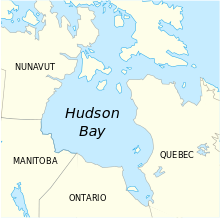 The Cree were first contacted by Europeans in 1682, at the mouth of the Nelson and Hayes rivers in what is now northern Manitoba, by a Hudson's Bay Company (HBC) party traveling about 100 miles (160 km) inland. In the south, contact was later. In 1732 in what is now northwestern Ontario, Pierre Gaultier de Varennes, sieur de La Vérendrye, met with an assembled group of 200 Cree warriors near present-day Fort Frances, as well as with the Monsoni, (a branch of the Ojibwe). Both groups had donned war paint in preparation to an attack on the Dakota and another group of Ojibwe. After acquiring firearms from the HBC, the Cree moved as traders into the plains, acting as middlemen with the HBC. Naskapi and Montagnais (together known as the Innu) are inhabitants of an area they refer to as Nitassinan. Their territories comprise most of the present-day political jurisdictions of eastern Quebec and Labrador. Their cultures are differentiated, as some of the Naskapi are still caribou hunters and more nomadic than many of the Montagnais. The Montagnais have more settlements. The total population of the two groups in 2003 was about 18,000 people, of which 15,000 lived in Quebec. Their dialects and languages are the most distinct from the Cree spoken by the groups west of Lake Superior. East Cree – Grand Council of the Crees; approximately 18,000 Cree (Iyyu in Coastal Dialect / Iynu in Inland Dialect) of Eeyou Istchee and Nunavik regions of Northern Quebec. Swampy Cree – this group lives in northern Manitoba along the Hudson Bay coast and adjacent inland areas to the south and west, and in Ontario along the coast of Hudson Bay and James Bay. Some also live in eastern Saskatchewan around Cumberland House. It has 4,500 speakers. Woods Cree – a group in northern Alberta and Saskatchewan. Plains Cree – a total of 34,000 people in Manitoba, Saskatchewan, Alberta, and Montana. Due to the many dialects of the Cree language, the people have no modern collective autonym. The Plains Cree and Attikamekw refer to themselves using modern forms of the historical nêhiraw, namely nêhiyaw and nêhirawisiw, respectively. Moose Cree, East Cree, Naskapi, and Montagnais all refer to themselves using modern dialectal forms of the historical iriniw, meaning 'man.' Moose Cree use the form ililiw, coastal East Cree and Naskapi use iyiyiw (variously spelled iiyiyiu, iiyiyuu, and eeyou), inland East Cree use iyiniw (variously spelled iinuu and eenou), and Montagnais use ilnu and innu, depending on dialect. The Cree use "Cree," "cri," "Naskapi, or "montagnais" to refer to their people only when speaking French or English. Each band remained independent of each other. However, Cree-speaking bands tended to work together and with their neighbours against outside enemies. Those Cree who moved onto the Great Plains and adopted bison hunting, called the Plains Cree, were allied with the Assiniboine and the Saulteaux in what was known as the "Iron Confederacy", which was a major force in the North American fur trade from the 1730s to the 1870s. The Cree and the Assiniboine were important intermediaries in the Indian trading networks on the northern plains. One major division between the groups is that the Eastern group palatalizes the sound /k/ to either /ts/ (c) or to /tʃ/ (č) when it precedes front vowels. There is also a major difference in grammatical vocabulary (particles) between the groups. Within both groups, another set of variations has arisen around the pronunciation of the Proto-Algonquian phoneme *l, which can be realized as /l/, /r/, /y/, /n/, or /ð/ (th) by different groups. Yet in other dialects, the distinction between /eː/ (ē) and /iː/ (ī) has been lost, merging to the latter. In more western dialects, the distinction between /s/ and /ʃ/ (š) has been lost, both merging to the former. Cree is a not a typologically harmonic language. Cree has both prefixes and suffixes, both prepositions and postpositions, and both prenominal and postnominal modifiers (e.g. demonstratives can appear in both positions). Golla lists Cree as one of 55 languages that have more than 1,000 speakers and which are being actively acquired by children. The Cree are the largest group of First Nations in Canada, with 220,000 members and 135 registered bands. Together, their reserve lands are the largest of any First Nations group in the country. The largest Cree band and the second largest First Nations Band in Canada after the Six Nations Iroquois is the Lac La Ronge Band in northern Saskatchewan. Hudson Bay Cree use decoction. 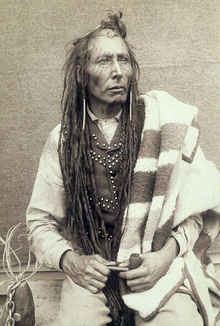 Mistāwasis ("Big Child", also known as Pierre Belanger), Chief of the Parklands/Willow Cree (Paskokopāwiyiniwak), born about 1813. He was one of the influential leaders of the House Cree or Wāskahikaniwiyiniwak and was largely responsible for convincing the Cree to accept Treaty 6. From 1852 to 1854, he supplied Fort Carlton with bison meat and pemmican. 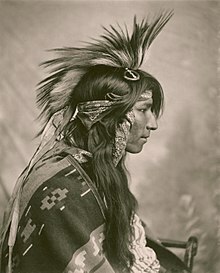 In his youth he gained the respect of Crowfoot, leader of the Siksika, by virtue of their constant military conflicts. The Blackfoot called Mistāwasis respectfully "The Iron Buffalo of the Plains." 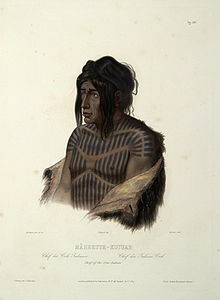 Mähsette Kuiuab, chief of the Cree, 1840–1843, Karl Bodmer. Buffy Sainte-Marie, Cree singer-songwriter, performing in Norway, 2012. ^ "Gateway to Aboriginal Heritage". Canadian Museum of Civilization Corporation. ^ Alexander Mackenzie,  Voyages from Montreal Through the Continent of North America to the Frozen and Pacific Oceans in 1789 and 1793. ^ Theresa, Schenck. Identifying The Ojibwe. Rutgers University. p. 396. ^ Goldsborough, Gordon. "MHS Transactions: Indian Migrations in Manitoba and the West". www.mhs.mb.ca. Retrieved 10 November 2018. ^ "TRADITIONAL CREE NATION CUSTOM COUNCIL - HOME OF THE KAMINISTIKOMINAHIKO-SKAK CREE NATION". johncochrane.ca. ^ MacKenzie, Alexander. (1793) Journal of a Voyage from Fort Chipewyan to the Pacific Ocean in 1793. ^ David Thompson noted, "The French Canadians...call them 'Krees', a name which none of the Indians can pronounce ...", "Life with the Nahathaways", in David Thompson: Travels in Western North America 1784-1812, Victor G. Hopwood, ed., Toronto: Macmillan of Canada, 1971, p. 109. ^ David H. Pentland, "Synonymy", in "West Main Cree", in Handbook of North American Indians, v. 6, June Heilm, ed., Smithsonian Institution, Washington, D.C., 1981, p. 227. ^ "Canada: 2006 Census". statcan.ca. 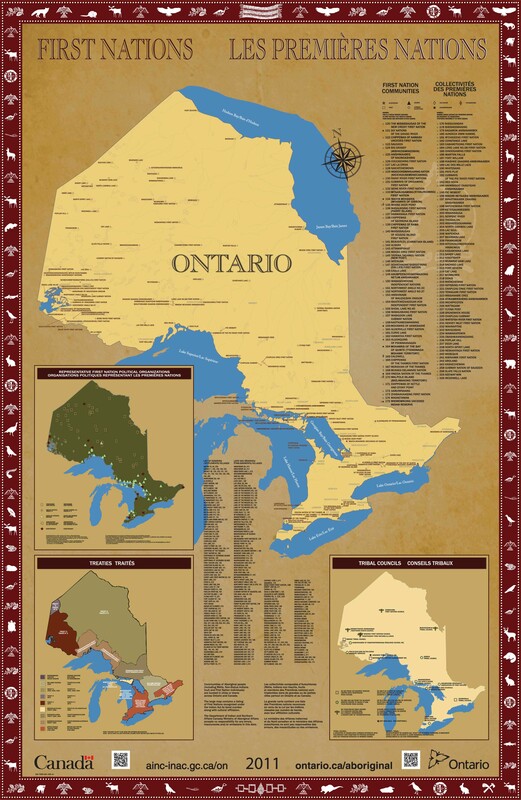 ^ "Languages of Canada", Ethnologue: Languages of the World. Note: The western group of languages includes Swampy Cree, Woods Cree and Plains Cree. The eastern language is called Moose Cree. Retrieved 21 September 2008. ^ "Cree", Language Geek. Retrieved 21 September 2008. ^ Josephson, Söhrman, Folke, Ingmar (July 2013). Studies in Language Companion Series : Diachronic and Typological Perspectives on Verbs. John Benjamins Publishing Company. p. 231. ISBN 9789027271815. Cree is not a typologically harmonic language. Cree has both prefixes and suffixes, both prepositions and postpositions, and both prenominal and postnominal modifiers (e.g. demonstratives can appear in both positions). ^ Golla, Victor (2007). "North America". In Moseley, Christopher (ed.). Encyclopedia of the world's endangered languages. London & New York: Routledge. pp. 1–96. ISBN 978-0-7007-1197-0. ^ a b "Source". canadiangeographic.ca. Canadian Geographic. Archived from the original on 14 April 2006. Retrieved 28 October 2005. ^ "Citizenship: The Métis Nation". Métis National Council. ^ "AHTAHKAKOOP FIRST NATION". ahtahkakoop.ca. Archived from the original on 1 August 2013. Retrieved 25 June 2011. ^ "Biography – AHCHUCHWAHAUHHATOHAPIT – Volume XIV (1911-1920) – Dictionary of Canadian Biography". biographi.ca. ^ "nehiyawak (Plains Cree) Leadership on the Plains - Our Legacy". scaa.sk.ca. Archived from the original on 6 October 2011. Retrieved 25 June 2011. ^ "Biography – KIWISĀNCE – Volume XI (1881-1890) – Dictionary of Canadian Biography". biographi.ca. ^ "Biography – PAYIPWAT – Volume XIII (1901-1910) – Dictionary of Canadian Biography". biographi.ca. ^ "History". Mistawasis First Nation. Retrieved 25 January 2018. ^ "Cree Nation". galafilm.com. Archived from the original on 1 July 2013. Retrieved 25 June 2011. ^ Poundmaker was given his name because he had a special skill in the construction of Buffalo Pounds for slaying of grazing bison. ^ "Welcome to Back to Batoche". www.virtualmuseum.ca. ^ "Alberta Online Encyclopedia - Treaty 6 - Making of Treaty 6 - The Signing". www.albertasource.ca. ^ "Peechee's Band - Genealogy.com". genforum.genealogy.com. ^ "The People Who Own Themselves". people.ucalgary.ca. ^ "U of R Press". esask.uregina.ca. Archived from the original on 11 November 2016. Retrieved 10 January 2017. ^ "Indians Who Fought in the 1885 Resistance". scribd.com. ^ "Biography – KĀPEYAKWĀSKONAM – Volume XI (1881-1890) – Dictionary of Canadian Biography". biographi.ca. ^ "Little Pine First Nation". saskbiz.ca. ^ "Lucky Man Cree Nation". sicc.sk.ca. Archived from the original on 11 June 2011. Retrieved 5 December 2018. ^ "Biography – PAPEWES – Volume XIII (1901-1910) – Dictionary of Canadian Biography". biographi.ca. ^ "Biography – MASKEPETOON – Volume IX (1861-1870) – Dictionary of Canadian Biography". biographi.ca. ^ "U of R Press". esask.uregina.ca. Archived from the original on 12 February 2012. Retrieved 25 June 2011. ^ "Kahkewistahaw First Nation". kahkewistahaw.com. Archived from the original on 11 February 2011. Retrieved 5 December 2018. ^ "U of R Press". esask.uregina.ca. Archived from the original on 26 December 2012. Retrieved 25 June 2011. ^ "U of R Press". esask.uregina.ca. Archived from the original on 26 August 2011. Retrieved 25 June 2011. ^ "Muskeg Lake Band: Metis Who Withdrew From Treaty - Canadian Folklore - French Canada". Scribd. Grant, Bruce (2000). The Concise Encyclopedia of the American Indian. New York: Wings Books. ISBN 0-517-69310-0. Stevens, James R. (1971). Sacred Legends of the Sandy Lake Cree. McClelland and Stewart Ltd.
Wikimedia Commons has media related to Cree.